How often have your kids made faces when you cooked vegetables for dinner? Let’s see. Generally, most of us are not very fond of veggies. But what if you found one recipe that will have the goodness of vegetables such as tomato, and will be finger licking tasty?! Today’s recipe is exactly one of them. 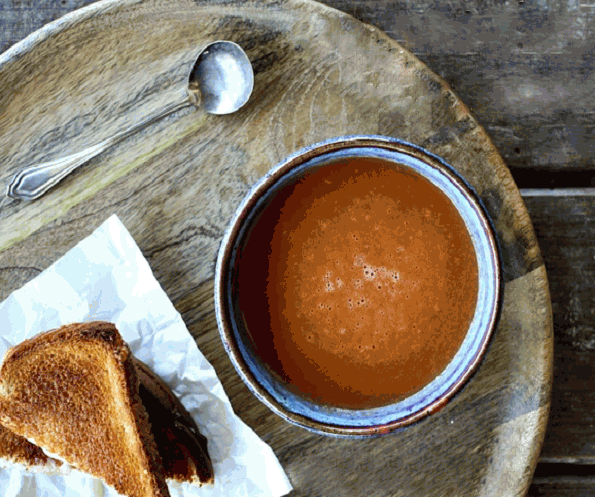 Creamy tomato soup from scratch has to be a family favorite. This is a list of ingredients for six to eight servings. Ripe tomatoes- 3 and ½ lbs, chopped. Fresh vegetable froth- 3 cups. Half and half- ½ cup. You need to follow these steps to prepare the soup. Take a pot, put it on light heat, and melt the butter in it. Add onion to it, the wilt over low heat for eight to ten minutes. While cooking the onion, put the garlic after sometime and keep stirring. Add flour to the mix and keep stirring for three minutes. After 3 minutes, add tomatoes, the tomato paste, sugar and the broth and keep cooking till it comes to boil. After the mixture has been boiled, reduce the heat to simmer and cover the pot. Cook this mixture for around 30 minutes. Sprinkle cloves, and mix salt and pepper to the mixture and stir. Remove the heat and put the whole soup puree into a mixer or blender. Make sure you do this very slowly. After blending, empty the soup into the pot again through a strainer. Stir in the half and half to the soup. Your soup is ready. Warm it a bit and serve when hot. This soup is best for winter suppers. Provide feedback by leaving a comment below. Sign up with us to know more recipes every day of the week.